Texas really misses Tristan Thompson inside. Yes, Thompson wasn’t polished offensively, but his rebounding and defense are major holes in the current Longhorn frontline. Gary Johnson’s rebounding also would be invaluable. Wednesday night Jonathon Holmes, Alexis Wangmene and Clint Chapman (three of the four forwards who played for Texas) combined to grab three defensive rebounds. The team only managed 17 defensive rebounds total (in comparison to 22 offensive rebounds for North Carolina). Roy Williams was pleased with his team’s intensity, but the ball boys could’ve used a little more initiative. At one point in the first half, Williams walked out on the court to personally wipe up a wet spot to the loudest cheers of the night. It’s hard to tell whether he was sending a message to the ball boys (for being slow to action) or to the Texas players (who seemed to be stalling the game by finding wet spots). Regardless, it got the Dean Dome fired up. J’Covan Brown isn’t Jordan Hamilton. Hamilton was a guy who could (and did) take over games pretty much singlehandedly, dictating that the offense be ran through him. Brown is much more susceptible to disappearing on the offensive end, as he’s much more of a shooter. Maybe it was just North Carolina’s interior length that kept him shooting on the perimeter, but Brown really struggled getting inside for most of the game. It will be interesting to see how his production changes as teams get more and more tape on him in conference play. This entry was posted on Thursday, December 22nd, 2011 at 12:44 pm by mpatton	and is filed under acc, big 12, microsites. Tagged: alexis wangmene, clint chapman, gary johnson, harrison barnes, j'covan brown, Jonathon Holmes, jordan hamilton, myck kabongo, north carolina, reggie bullock, rick barnes, roy williams, texas, tristan thompson. You can follow any responses to this entry through the RSS 2.0 feed. You can leave a response, or trackback from your own site. 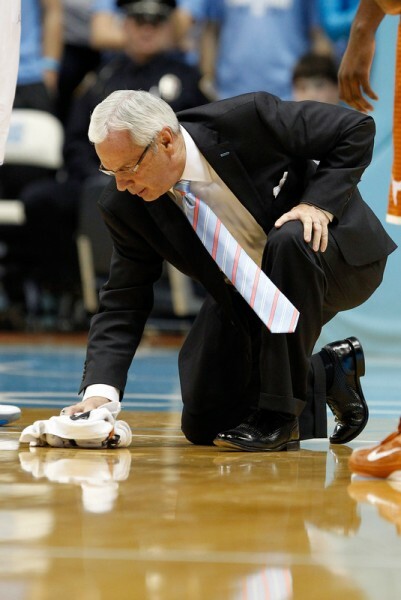 It was near the end of the first half when Roy went out on the court to wipe up the wet spot. Why is the point guard who transferred last year in the first picture? You really couldn’t find one picture featuring Reggie Bullock from the game?